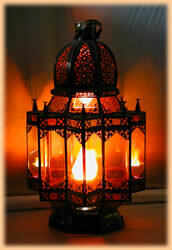 In the pipeline - Moroccan Lanterns : floor standing, wall-mounted or ceiling-hung. Moroccan lanterns provide just about the perfect housing for displaying the FireLamp to its best effect. The numerous glass panels provide multi-faceted reflective surfaces which serve to multiply the flames within. The intricate carved metal-work throws wonderfully detailed patterns in firelight hues on the lamp's surroundings whilst fiery glows flicker around the inside of the dome.